Transparent effects have had a prominent place in the user interface of Mac OS X ever since the Mac got a face lift with recent versions of MacOS Mojave, High Sierra, Sierra, OS X El Capitan and Yosemite. Many users like the transparency found throughout the window title bars and sidebars, but some users may not like the feature, and additionally some Macs can gain a performance boost by turning off the eye candy effect of translucent UI elements. Disabling transparency also has the side effect of making the user interface look slightly different, as the window title bars, buttons, and sidebars will no longer pick up some color cues from items behind the window. Whether or not any of this is desirable to a Mac user likely depends on personal preference, but it’s easy to toggle on and off again so if you decide it’s not for you, there is little effort to switch things up. In terms of UI appearance, the effect is subtle. Aside from the difference in appearance, the settings change can also improve performance quite a bit, particularly on some older hardware, and it notably reduces the CPU usage of the WindowServer process. In fact, this is one of those adjustments that can be made to settings to speed up Yosemite in particular, though the effect carries forward into Mac OS X 10.11 as well albeit less notable. Users will also find that disabling transparency can boost the frame rate of drawing items on screen in Mac OS X, which is observable on some Macs directly if they had stuttering animations in things like Mission Control, but it can be measured with the FPS FrameMeter gauge of QuartzDebug for users who are more technically inclined as well. It’s worth mentioning that another option is the Increase Contrast setting in Mac OS X, which disables transparency as well while simultaneously making window and UI elements look a bit more obvious, which can be helpful for those who find the newer Mac OS appearance overbearing. What amazes me is that Wondows has managed to have translucent Windows for over a decade with no performance hit. Then apple implements transparency in OS X and it crawls and causes FpS dropping. What gives? Looks gauche anyway but come on. No performance hit? Which world of ignorance do you live in, one of the most articles about Vista for example was how to turn all the candy off due to massive lag in the UI. Wow, now that’s what I call an exaggerated counter-point. You are literally referring to a legacy Operating System that came out in the mid 2000s (which was essentially – and unofficially – a beta of Windows 7) and you’re comparing it to a current day version of Mac OS X? Also, to touch on your point regarding Vista; the reason why Vista had so many problems was that it required too many system resources at a time when 4 GB of RAM was considered a very large amount. We’re talking around 2005-2006 here, come on. So it’s not that Vista was bad on performance, it’s more accurate to say that it was not ready for mass adoption due to hardware constraints and affordability. In the case of Mac OS X however, I’ve seen many instances of performance issues UNRELATED to available and plentiful hardware resources. I cannot stand the amount of praise OS X gets, it’s a completely overrated operating system and a complete pain in the you know what when it comes to support and supporting it. If you’re going to defend Mac OS X, don’t come up with some lame comparison to a much older operating system. OP said “Wondows has managed to have translucent Windows for over a decade” – that means Vista. What I would like to see restored from earlier versions of OSX is the option to have up and down arrows on the scroll bars, last seen around OSX 10.6.8, preferably close to one another at one end of the scroll bar. It is so hard to move small distances in a long document using the scroll bar alone. There is a tendancy to overshoot, using the scroll bar, and using the up and down cursor keys is not a good substitute. The up and down arrows allowed for much more precise small movements in long documents. Eliminating them was a poor decision. Is there a way to recover that function? This post has nothing to do w the transparency post… sorry, but Im disparate to get some help w bizarre problem that has become more than simple annoyance. Safari & Chrome at most current levels. First noticed in browsers… using Univ. Access, zoom up the window mag. Attempt to move cursor using track pad and cursor takes on a random & capricious life of its own–moves randomly across window (to window boundary. Not off window). Most effective way to stop is un-zoom to zero mag. I don’t have a vid of this. I don’t know if a mouse produces same effect as track ball. This not a symptom of 10.11.x as is it existed in 10.10.x and I believe 10.9.x. Im inclined to believe it is endemic tooth’s one machine, as our 2nd MacbookPro non retina and older is not symptomatic. At the suggestions of Apple phone support and a really good authorized Apple reseller & repair, I tried some things including updating to 10.11. The step is costly: replacing the trackpad. As u know its involved & expensive ($300+) on a Macbook Pro w retinal display. Sorry for the long windedness, but $300 is not lunch money. Try using a USB device and seeing if that still happens. Also, clean the trackpad surface with a small amount of rubbing alcohol and make sure its totally dry. Gunk on trackpads and tracking surfaces can cause all sorts of ruckus and weird behavior. 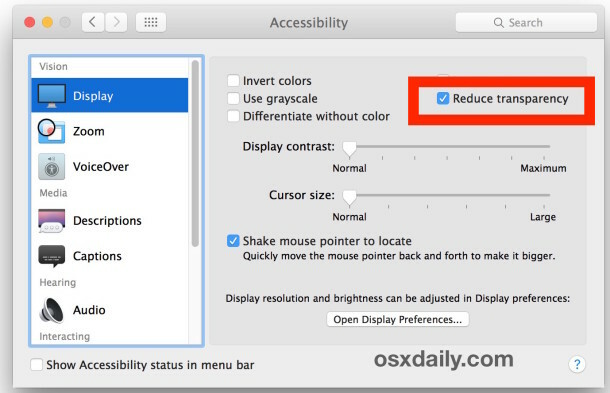 I tried this, now my iMac is crazy with display colors; El Capitan. I’m a user, not a techie and would like to go back to a recent day when things were ok but looks like it’s a major operation! I hate to ask but is there an easier way to accomplish that? Sorry for long story. Give me solid-everything. I’m no fan of the iOS influence here.